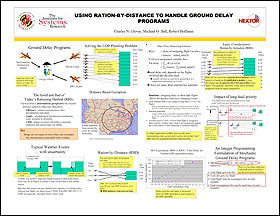 This poster by student Charles Glover is one of the five winners of the ISR Systems Symposium poster contest. Click on the links in the story to view each winning poster. Five student research projects are winners in the poster contest held at April’s ISR Systems Symposium. You can view these posters online by clicking on the links provided. Each winning student team is being allocated $500 to support research-related expenses (the funds will be managed by the faculty advisors). Congratulations to the students for this recognition of their research and their excellent poster presentations! Our thanks to the symposium committee for their hard work and diligence in the judging. Once again, congratulations to the winners, and thank you to all our students for such a fine-quality group of posters.